Creek Audio Evolution 50A review | What Hi-Fi? 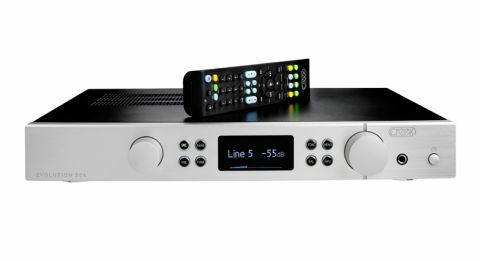 The Evolution 50A is part of Creek Audio’s next generation product range, and the preceding model to the company’s higher-ranging Evolution 100A (£1500). It’s been a few years since we last had the pleasure of testing a Creek Audio amp, and if the 50A is anything to go by, perhaps we’ve been missing out. Performance-wise, we’re impressed. Fast, agile and articulate, the Evolution has many selling points that all combine into one thing: it’s bags of fun. Whether it’s wallowing in the jaunty piano-led rhythms of Nina Simone’s My Baby Just Cares For Me, or throwing its all into the lively tempo of Daft Punk’s Beyond, the Evolution’s exuberant, full-of-beans delivery zings through tracks with pace and precision. It’s punctual and demonstrates a firm grip on timing. It’s the sort of amp that makes albums enjoyable time and time again. Its focused, transparent midrange is one of the most expressive we’ve heard at this price, too, proving more than capable of getting across the intimacy of Eminem’s emotionally-charged vocals in Headlights. Wonderfully detailed, the Creek not once forsakes the subtleties for the bigger picture; as The Fellowship from the Lord of the Rings soundtrack fills its wide-open soundstage, intricate string and woodwind sequences pull through with definition and clarity. It has the stringent organisation to give the scrupulous Cyrus 6a a run for its money, with each instrument meticulously placed, and spoilt with space to work in. And dynamically, the Creek is strong as it works its way up (and back down) the composition. That said, it doesn’t have as much appetite for the track’s orchestral crescendos as the powerful and authoritative Naim Nait 5si (£925) and Rega Elex-R (£900) do, and lacks the bass punch and weight for the listener to really appreciate the thumping drumbeat underpinning Drake’s Take Care. That low-end deficiency puts the 50A’s tonality a little on the lean side, so taking a little care with system matching would be sensible. You’ll hardly notice the shortcoming paired with standmounters, but those fond of floorstanders should choose rich, sweet-sounding towers (say, the Q Acoustic Concept 40s) to flesh out the sound somewhat. The headphone output is decent. We clap our ears on the AKG K701s (£200) and are met with an equally enjoyable sound that too basks in openness, articulation and rhythmic aptitude. As expected, bass depth still feels deficient through the cans, which listening through the Naim’s headphone jack only confirms. Potential buyers ahould note that the Evolution takes a full weekend’s running-in to even out the 50A’s out-of-the-box thinness, but it's worth the wait. The slim unit looks built to last, and garners aesthetic appeal with a brushed aluminium (black or silver) front panel. Its largely symmetrical layout gives it a neat façade: a clear white-on-black OLED display is book-ended by an input selection dial (inputs change with an indicative click) and a slightly larger volume knob. A headphone output and power button also feature on the right-hand side. Oddly, the remote can’t power the amp on or off, but we like its substantial size and weight, and well-labelled keys. Creek advises that the heat sinks on top of the unit to aid ventilation should be kept clear to prevent overheating, so we wouldn’t box it in on your rack’s middle shelf if it isn’t very tall. Its lack of digital inputs may bother some, though a decent choice of analogue connections make it a fairly well equipped (albeit traditional) amp. Accompanying a 6.3mm headphone output and a balanced XLR input are a handful of line level inputs – of which two, we are pleased to report, can cater for a range of upgrades. Input one can be turned into a phono input with one of the company’s Sequel phono modules (ranging from £125-160 depending on sensitivity ratings) fitted, while input five is an expansion port that can be replaced by Creek’s plug-in AMBIT Tuner (£125) or Bluetooth-toting Ruby DAC (£400). We tip our hats to Creek. Its Evolution 50A amp has come into a market that’s dominated by giants like Rega, Naim and Cyrus at this price, and duly holds its own. It may not be the complete product (a lack of solidity and bass weight sees to that), but has the entertainment factor that’ll have you listening to music for hours on end, and that says a lot.